Like Handel before him, Hasse worked at Hamburg opera and then travelled to Italy. In the 1730s he came to rest in Dresden where he composed and performed opera as well as sharing responsibility for sacred music in the Royal chapel. Hasse's operas are being rediscovered on disc, but this programme from the Sächisches Vocalensemble, the Batzdorfer Hofkapelle and Matthias Jung showcases some of his major sacred music. Hasse's Te Deum was written for the dedication of the new court church on the Feast of Saint Peter and Saint Paul in 1751. It was originally performed with Hasse's Mass in D minor. In Dresden the celebrant alone traditionally sang the verse Salvum fac populum tuum; accordingly Hasse later added a soprano solo setting of this verse, so that other churches could perform it. The text employed is quite substantial. For the ceremonial performance Hasse added an instrumental introduction and the setting of the words is quite brisk. The work has a galant grace and a lively melodic attractiveness, which must have made it highly suitable for court performance. 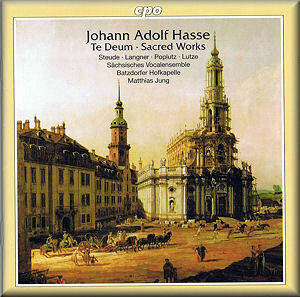 It became one of Hasse's best known sacred works. The Laurentine Litany was written in 1750 for an entirely smaller-scale performance at Saturday afternoon devotions. It wasn't normally Hasse's role to provide music for these lesser services, but there must have been some reason for him deciding to write the setting. The litany comes from Loreto, a central Italian Marian pilgrimage site. Whilst not as grand as the Te Deum it still has an elegant charm and mixes solo moments with choral items. Sub tuum praesidium is a short piece. It was originally the antiphon to the Nunc Dimittis at Compline, but in Germany the text was expanded into a Marian prayer. This form is the one set by Hasse in 1750, also for Saturday afternoon services. Two Tantum Ergo settings are included, both quite substantial. A short hymn used for sacramental devotions dates from the mid-1750s (Tantum Ergo in C minor) and from around 1780 comes the Tantum Ergo in E flat major. This latter Tantum Ergo was written by Hasse when in retirement in Vienna. He sent the manuscript to Dresden but it does not seem to have been taken up. The programme concludes with the earliest piece on the disc, a setting of the Regina Coeli. This seems to have been in use since 1710 and remained in use by the Dresden Jesuits until the 20th century. Hasse's music is fluent and graceful with all the galant qualities of the period. It doesn't dig beneath the surface, but must have made an attractive backdrop to court or church ceremonial. The Sächsiches Vocalensemble makes a nice bright sound with a focused line and good sense of style. The Batzdorfer Hofkapelle make a clean lithe sound. Both choir and orchestra are relatively small, as was probably the case at the original performances. Soloists Barbara Christina Steude, Susanne Langner, Georg Poplutz and Matthias Lutze do not have great voices, but they are young and bright, without overly-intrusive vibrato and they blend nicely. Matthias Jung conducts with precision and keeps the music moving without pressing. The CD booklet includes a full article about Hasse and the music, plus texts and translations. This isn't great music, but it is well crafted and attractive and is presented in persuasive performances.